It’s one thing to be known among your friends for your famous boeuf bourguignon recipe. It’s another thing entirely to open your own restaurant based on that recipe. All of a sudden you need to deal with things like quality of ingredients, scaling up that favourite recipe to serve multiple times a night, and making sure that each serving is of consistently high standards and won’t accidently make a customer sick. Julie Nielsen PhD, Research Associate with Nicol MacPherson, MD Clinical Principal Investigator. It’s much the same thing with T cells, a type of white blood cell that’s particularly good at attacking tumors. 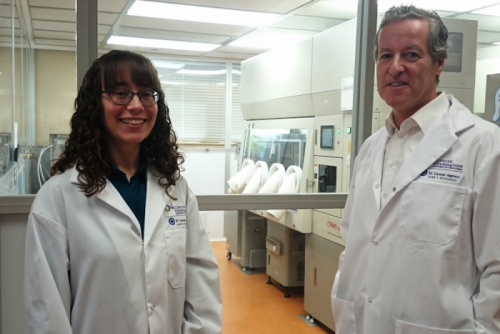 But taking them out of the lab and into the clinic takes a lot of work – work that the BC Cancer Agency’s Dr. Brad Nelson is focused on right now. His goal is to treat lymphoma patients with T cells that recognize the driver mutations in their cancer cells. There can be hundreds, even thousands, of mutations in a cancer cell, but the vast majority are passenger mutations – just along for the ride. Only 5-10 of them are what scientists call “driver” mutations – the ones that generate signals for the cancer cells to survive, grow and spread. Focusing on a form of cancer called follicular lymphoma (a common form of non-Hodgkin lymphoma), his team has found that they can take a blood sample from someone with the disease and, by stimulating with mutant peptides, isolate T cells that recognize the driver mutations in the patient’s tumor. Within a few weeks, the T cells proliferate to enormous numbers and, with further enrichment, can reach almost 100% purity. The concept is to then infuse the T cells back into the patient’s bloodstream, where they can attack lymphoma cells carrying the driver mutations. So far Dr. Nelson’s team has produced mutation-reactive T cells from a small set of patients, demonstrating that it can be done. But now they are preparing for the final step: infusing the T cells back into the patient’s bloodstream. When they do, it will be the world’s first trial targeting driver mutations in lymphoma, and one of only a handful targeting any cancer. Dr. Nelson chose to focus on follicular lymphoma for several reasons. For one, the driver mutations have been well characterized, so he knows which mutations he needs to target. About 50 driver mutations have been identified in follicular lymphoma, of which a given patient might have five or six to target. For another, follicular lymphoma is what is known as an indolent cancer – it grows and changes very slowly, giving the research team time to produce enough mutation-reactive T cells for treatment. Finally, while follicular lymphoma responds well to treatment, and can go into remission for long periods of time, it never leaves the body entirely. Patients are left with the possibility that the cancer will re-awaken, at which point it might not be so amenable to treatment. Tackling this incurable cancer, therefore, presents real hope. This image shows how the research team detects T cell responses using a method called ELISPOT. 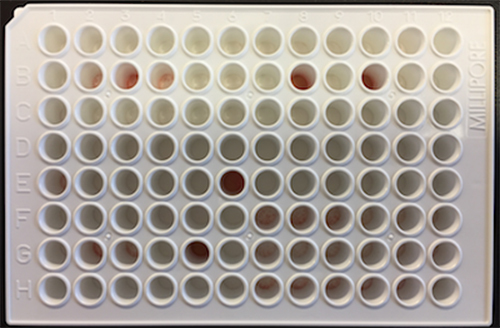 Each well of the plate contains a different combination of T cells and mutant peptides. The red spots are made by T cells when they recognize a mutation. The positive T cells are then expanded for further analysis and, during the clinical trial, will be used to treat the lymphoma patients. Beginning in 2018, Dr. Nelson’s goal is to open a phase 1 clinical trial involving 10 lymphoma patients. Patients will be infused with their own customized batch of mutation-reactive T cells to assess whether the T cells successfully attack the cancerous cells. Before he can do that, though, he needs to get ready to turn his personal recipe into a restaurant-ready product. And that’s where a lot of lab-based ideas fall down – researchers don’t have the funding they need to test and implement the protocols that will meet Health Canada’s requirements for testing in humans. To use T cells at the clinical level, they need to be manufactured in a highly sterile, controlled environment. This entails growing them in an incubator with no contact with the outside world. Furthermore, every ingredient used in the enrichment process, including the medium in which the cells grow, has to be manufactured according to a standard known as “good manufacturing practice”, or GMP. While follicular lymphoma is the immediate target, Dr. Nelson believes that the approach can be extended to other cancers, provided that the important driver mutations can be identified.